Signs of market recovery in 2017, with an increase in supply and total sales up 154% from 2016: Total auction sales for Oscar Murillo raised just under $1.1 million in 2017, with an increase of 145% from $428,000 in 2016. Although still down 66% from the $3.2 million average in total sales between 2013-2015, it does nonetheless show a marked improvement. High Sell-through rate of 83% in 2017: Murillo’s market has had a respectable sell-through rate of 83% in 2017, up from an average of 75% between 2015-16. Average price increases for both paintings on canvas and paper in 2017: Although the markets for Murillo’s works on canvas and works on paper are still contracting, when viewed in comparison to the artists peak years (2013-2015), they have nonetheless shown significant improvement since 2016. Increase in the proportion of lots selling above $100,000 in 2017: Half of Murillo’s artworks sold at auction in 2017 achieved sale prices in excess of $100,000, representing five lots sold and increasing proportionally from just 16.7% of lots sold in 2016 (1 lot sold). Exhibition and primary market activity: In addition to improved auction sales, Murillo’s primary market and exhibition activity remained buoyant in 2017, with 2 commercial and 12 institutional exhibitions. The majority of Murillo’s exhibitions in 2017 were group presentations, with four solo projects. 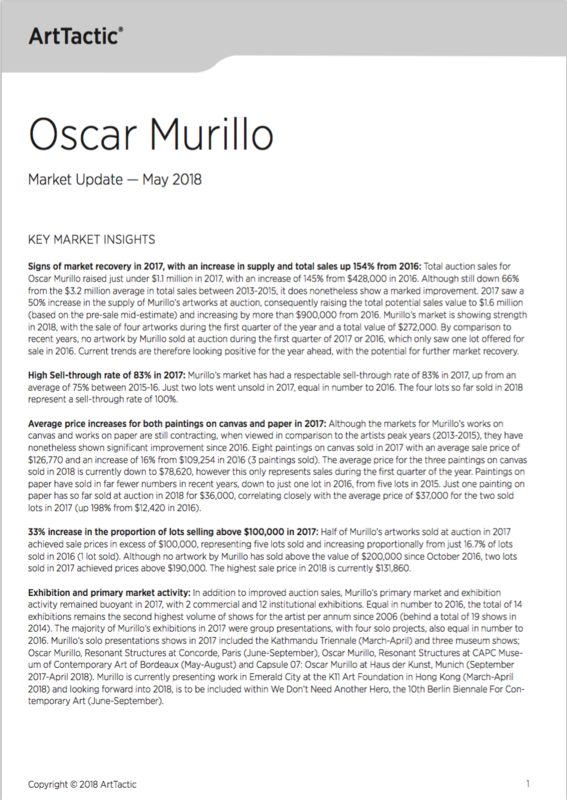 This Market Update follows on the Oscar Murillo Market Report published by ArtTactic in June 2017.